If you think you know the Honda Civic, think again. Chances are, the last Civic you were in was nothing like the newly re-designed 2016 version. Born in 1972, the Honda Civic has carved a reputation of dependability, value and style throughout the globe, and is currently available in over 160 countries - about the same number of markets as Coca Cola! As a bench mark of reliability, the intrepid Civic has been the one of the most popular car in Canada for the last 14 years in a row. Not bad for a country that has extreme weather, eh? 2016 marks the tenth generation of the ever-popular Honda Civic, so forget everything you think you know about the Civic, and hurry down to Jim Skinner Honda for a first-hand look at the all- Honda Civic. We're at 3823 Ross Clark Circle NW in Dothan, AL, just a stone's throw from Troy, Ozark, Enterprise, Marianna, Chipley, and Bonifay. You must see the new Civic because it has evolved into the versatile small car of tomorrow, right before our eyes. 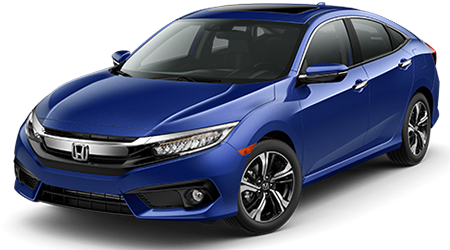 The gorgeous 2016 Honda Civic has just arrived at Jim Skinner Honda, and we are easy to find at 3823 Ross Clark Circle NW in Dothan, AL. Drop by to see the new Civic in its best light, and in all the different trim levels and hot colors for 2016. We have been selling and servicing the Honda Civic for decades, and when you shop Jim Skinner Honda, your satisfaction means a great deal. Our reputation for sweet deals and amazing follow-up service is legendary around Troy, Ozark, Enterprise, Marianna, Chipley, and Bonifay. Stop by and say hello! **For more information, visit AutoGuide.com. AutoGuide.com is a registered trademark of Verticalscope Inc.
**For more information, visit www.kbb.com. Kelley Blue Book is a registered trademark of Kelley Blue Book Co., Inc.